Short-finned pilot whales are about 1.6m long, when they are born. Adult males can grow to 7m long, while females usually reach only 5.5m. Maximum weight is about 3300kg (males). There are 7-9 pairs of short, sharply pointed teeth in each jaw. Lifespan is, at least, 60 years for females and only 45 years for males. 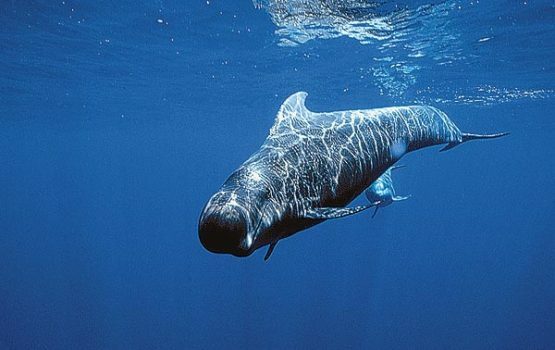 The short-finned pilot whale has a long but robust body. The melon presents a globe shape and can overhang the front of the mouth. There is a very short, barely visible, beak. 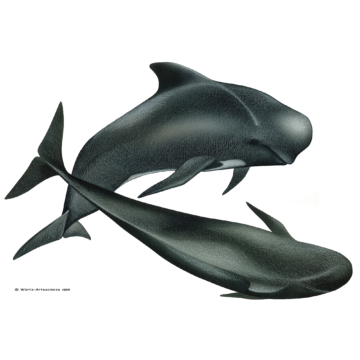 The dorsal fin is characteristic for the pilot whale’s species: set anteriorly, about 1/3 of the way back from the head. The dorsal fin is long and wider-based, falcate, and rises at a shallow angle. The males have larger dorsal fins than females. The pectoral flippers are short (about 1/6 of the total body length). The body is basically dark grey or brown to black. There is usually a white or light grey stripe behind the eye, extending back up to the dorsal fin. There is also a light grey or white saddle on the back behind the dorsal fin, which is variable in shape and brightness. In short-finned pilot whales this saddle often extends all the way to the fluke in adult males. Ventrally, they also hold a white or light grey anchor-shaped patch. Short-finned pilot whales feed mainly on squid, but possibly take fish as well, when available. These dolphins probably take most of their prey at depths of 300-500m deep. School size is around 15-50 individuals, of mixed sexes and ages. Pods of several hundred short-finned pilot whales are reported, and members of this highly social species are almost never seen alone. Strong social bonds could explain why pilot whales are amongst the cetaceans species than more often mass-strand. In some groups, males leave their maternal group, however females remain in theirs for life. They often associate with other species such as bottlenose dolphins (Tursiops truncatus). Short-finned pilot whales range from tropical to warm temperate waters worldwide, however they are absent from the Mediterranean Sea. 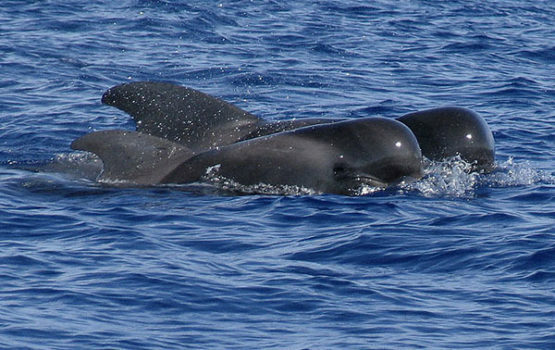 In areas where the range overlaps with that of long-finned pilot whales (Globicephala melas), it can be difficult to distinguish between the two species. The short-finned pilot whales tend to be brighter, especially the adults. 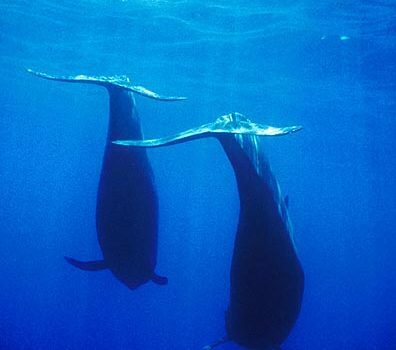 They are usually very shy towards boats compared to long-finned pilot whales. Due to the size difference of the pectoral flippers, the easiest way to distinguish between these species is when the flippers are observed. This is a seasonally frequent sighted species in the Azores. On average they are present in 20% of our trips at sea. Although sightings can occur in April, most often we start observing them in May. 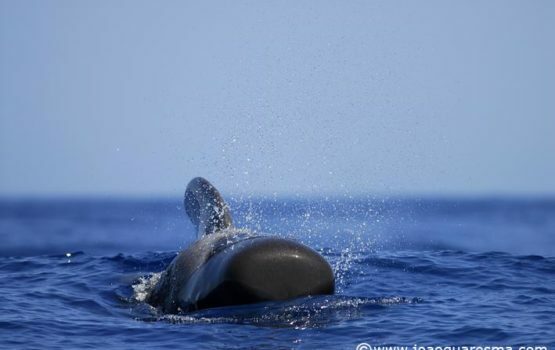 They are most frequently observed in June and July but we have sightings of short-finned pilot whales until November.